Facebook’s new Developer Platform has been live for nearly a day, and data is coming in on which third party applications are the most appealing to Facebook users. The top application, by far, is music service iLike. They currently have just under 40,000 Facebook users, more than the rest of the top ten applications combined. The application was added by 10,000 users within the first ten hours of the service being live, and 10,000 more in the following three hours. It seems to be increasing by about 100/minute at this point. 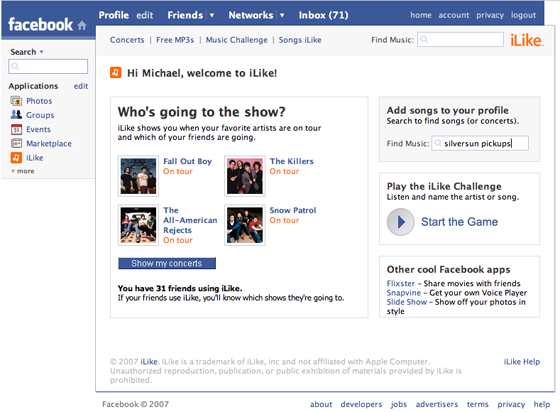 Once installed, users can search for and add their favorite music and concert information to their profile. Competitor MOG is also popular, coming in currently as the fifth most popular Facebook application and just over 3,000 users. Causes On Facebook, the application that we covered yesterday, is in the top twenty apps and has just over 1,000 users.